For Christopher J. Schneider, associate professor of Law and Society, sociology isn’t something that should be discussed only in lecture halls and classrooms; sociology is a field in which everyone should participate, which means taking it out of universities and into the public sphere. And so the Sunday Sociologist began in a coffee shop in Kelowna, British Columbia. According to Schneider, coffee houses have long served as hosts to a number of social debates and discussions. In a recent article in Global Dialogue, the official International Sociological Association newsletter, Schneider explained how he worked with his colleague Ariane Hanemaayer to launch the Sunday Sociologist to bring together people with a wide range of perspectives. "We invited members of the community, university faculty, and students to come once a month to a local coffee shop to debate and discuss issues of mutual importance (national news stories, viral videos, political projects, etc. )," they wrote. The goals for these meetings were twofold: to bring together a diverse group and to engage in a conversation about local and global issues. “The conversations often prompted fruitful and spirited debates, which helped to crystallize, shape, and develop our lives as professional sociologists by bringing to our attention important private troubles and public issues beyond the university classroom,” wrote Schneider and Hanemaayer. 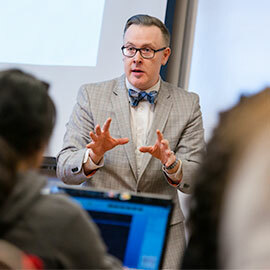 Ultimately, Schneider's interest in and commitment to public sociology drew him to Laurier’s close-knit Brantford campus, which provides community members with many opportunities to engage with and learn from the university. “Laurier is a leader in bridging the gap between the community and university," he said. Schneider's commitment to public sociology has spread to his research. Over the last decade, social media has not only altered the way we communicate, but also increased public interaction with academic research. Schneider’s own research methodology includes tracking news and popular culture to examine a variety of topics that relate to his research in criminology and sociology. Currently, Schneider is examining how police forces across North America use social media as a communications vehicle. In his recently published study, Schneider looked at more than 100,000 tweets from the Toronto Police Service. He found that Twitter acted as a beneficial tool for police work because it provided a platform for tips and eyewitness accounts, as well as community issues. Should Police Use Body Cams? Schneider’s research on social media and crime led to him investigating the hot topic of police wearing body cameras. “It has become clear that activity on social media has removed some elements of symbolic control away from police officers,” said Schneider. “Police have to work to regain that control and one way of doing so is by producing official records of events, and this can be accomplished with police body cameras." Schneider recently spoke to Canada AM about this issue after a fatal policing shooting occured in North Charleston, U.S. As a believer in public sociology, Schneider sees many benefits to providing insight from his research on both traditional and social media. He has provided comments to The Toronto Star, The New York Times, CTV News and CBC TV, to name a few examples.